While the overall lacklustre performance of the property market last year is expected to persist, the industrial sector is likely to remain a bright spot, according to CBRE | WTW’s Real Estate Market Outlook 2019 for Malaysia. The report was released in Kuala Lumpur on Jan 16. As opposed to conventional ad hoc projects, industrial developments today are planned quite similar to gated-and-guarded residential schemes. “It is cleaner, environment-friendly and secure,” says Foo. Investing in industrial properties is usually for the bigger players as the amount involved is more than RM5 million. Rental yield is around 7% to 10%, says Foo. On the whole, the property market for 2019 will remain challenging across all sectors. “While demand for landed properties is still supported by demographic growth, the areas of concern are high-rise residential units with low occupancy,” he says. “Affordability continues to be a challenge for the residential sector and purchasing sentiment is weak as people are more prudent when it comes to big-ticket items. Things will continue to remain challenging in the retail sector. “Tenants are getting restless and we are seeing a trend of month-to-month tenancy. The different tenancy terms are very much dependent on turnover rental, rather than fixed overheads,” says Foo. Nonetheless, the top five shopping malls — Pavilion, Suria KLCC, Mid Valley, 1 Utama and Sunway Pyramid — continued to perform well last year, supported by the three-month tax holiday. For the office sector, movements from old buildings to new purpose-built premises were seen last year. To complement the sector, co-working spaces also saw an increase. Another bright spot is Sabah’s tourism market with the Pan Borneo Highway being the main catalyst. “Places at the tip of Borneo in Sabah are on a par, if not better, than popular tourist spots such as Bali. With the opening of the Pan Borneo Highway, we strongly believe the tourism market will move to a different level,” Foo says, adding that there are not enough world-class resort hotels in Sabah. He adds that a new airport in Penang and the upgrading of the Kota Kinabalu airport will boost the hotel and tourism sectors. The industrial sector in Iskandar Malaysia looks relatively healthy this year, says CBRE | WTW Johor Baru director Tan Ka Leong in his market outlook presentation for the southern state. Because of limited new supply of industrial properties, he foresees demand for build-to-sell industrial complexes and medium-sized detached factories in managed industrial parks. Transaction volume of industrial properties grew 10% last year. As for the hotel sector, it will see 2,250 new rooms from six hotels this year. “We believe that an increase in tourism activities and catalytic developments in Iskandar Malaysia will ensure the sector performs well this year,” he says. The state’s property market is expected to see its high-rise residential vacancy go beyond 50% for the first time. “We believe prices and rents will go down. It is definitely a buyers’ and tenants’ market with plenty of choices — old and new properties — in prime locations at attractive rents and prices,” says Tan. The high-rise residential sector will see an additional 10,500 units this year or 10% of the existing high-rise supply of 102,851 units. In 2017 and 2018, 40,000 high-rise units were added to the market. Prices of such units remained stable at RM400 psf last year due to too few transactions. “Of the 950 high-rise residential transactions last year, only 17, or less than 2%, were priced at above RM600 psf,” Tan says. Landed residential properties are expected to see stable prices but slightly lower rents this year. There will be an additional 6,500 landed residential properties this year, or 2% of the existing supply of 326,444. Last year, the landed residential sector saw 7,000 new units and a 20% drop in transaction volume. However, prices remained stable at RM330 psf. According to Tan, demand is mostly for houses priced at RM450 to RM650 psf, which can still be found in fairly good locations in Johor Baru. For the office sector, he says there is a shift towards new purpose-built offices. He cites the example of professional firms EY and KPMG moving to new premises in Medini. He expects the vacancy rate to increase beyond 35% from the current 26%. Two office towers are expected to be completed this year, contributing 928,450 sq ft or 16% of the existing 5.84 million sq ft office space. As for the retail sector, Tan believes the entry of new malls will create stiff competition and old malls will see higher vacancy, lower rent and even closure. He expects the vacancy rate to rise to 30% from the current 25%. There will be six new malls this year, contributing 3.7 million sq ft to the state’s retail sector. CBRE | WTW Penang director Peh Seng Yee foresees the Penang industrial sector doing well, supported by new investments, continued reinvestments and the expansion of the Batu Kawan Industrial Park. Other bright spots in the state are the landed residential and hotel sectors. Peh notes that these are attractive sectors to look into, particularly housing schemes in good locations or near infrastructure, as well as boutique hotels and resorts. In addition to the proposed new Penang airport, which will also benefit the hotel sector, the main catalysts that can spur the property market will be the Penang Transport Master Plan and land reclamation projects. This year, high-rise residential properties in Penang are expected to see a price correction in the secondary market and more affordable units on offer. “The high number of overhang in the high-rise residential property segment offers good bargains for purchasers,” says Peh. Of the residential overhang of 3,261 units in Penang, 68% or 2,200 units are condominiums and apartments. Of these, 37% or 1,190 units are priced at RM500,001 to RM1 million and 25% or 823 units, above RM1 million. As for the office sector, Peh anticipates the purpose-built sector to adjust its gross rents upwards and future developments to be located away from the central business district. On the retail sector, he opines that retail malls will continue to face challenges from online shopping platforms. 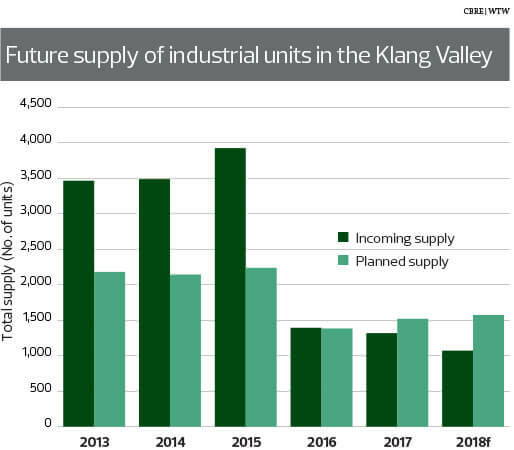 In presenting the market outlook for the Klang Valley, CBRE | WTW Kuala Lumpur director Ungku Mohd Iskandar says he foresees little growth across all sectors save the industrial sector. “E-commerce will boost demand for industrial properties located close to ports, airports and the city centre, which enhance last-mile delivery. Technology and innovation have also pushed the industrial sector to more modern and cleaner premises. We foresee good opportunities in the industrial sector,” he says. The industrial sector in the Klang Valley is expected to perform better this year. “Bank Negara Malaysia data shows that our foreign direct investment is hovering at RM30 billion to RM40 billion a year with the manufacturing sector taking up almost 97% of the industrial space in the Klang Valley. With the Industry 4.0, we expect demand [for industrial properties] to remain on the upward trend,” says Ungku Mohd Iskandar. He adds that infrastructure development continues to be a catalyst, with new growth areas expected to spring up along the West Coast Expressway and LRT3 and MRT2 lines. As for the industrial sector, he believes the focus will be on the western region — Westport, Pulau Indah’s Free Trade Zone expansion, The Compass @ Kota Seri Langat, KLIA Aeropolis Digital Free Trade Zone Park, Subang’s aerospace and aviation hub — as well as the UMW High Value Manufacturing Park @ Serendah in the north. Industrial properties in certain densely populated and mature areas such as Bandar Sunway and Petaling Jaya are also being redeveloped for full commercial use. There will be a significant increase in supply until 2021 with some new office buildings having a net lettable area of over one million sq ft each. This is on top of the existing 109.7 million sq ft of office space in the Klang Valley. On the retail sector, he says new malls, less strategically located malls and neighbourhood malls will face challenges. “We are seeing a new trend of month-to-month tenancy and a turnover rental, which poses the question of sustainability for these premises,” says Ungku Mohd Iskandar. Last year, four new malls were completed. By 2020, an additional 20% of the existing supply or 11 million sq ft of space will enter the retail market. This will come from, among others, Tropicana Garden Mall, TRX Lifestyle Quarter and Pavilion Bukit Jalil. As for the hotel sector, the situation will remain stable as more luxury hotels, including Kempinski Hotel and Fairmont Kuala Lumpur, will enter the market in 2020. “We believe the average occupancy rate and room rate will remain stable at 74% and RM270 respectively,” Ungku Mohd Iskandar says, attributing this to an increase in affluent tourist arrivals and domestic tourism picking up momentum. In Sabah, tourism and government allocation will continue to boost the property market this year. “The Pan Borneo Highway will open up new areas and bring about prospects for resort hotels outside Kota Kinabalu,” says WTW Sabah director Cornelius Koh. Incoming supply of rooms in Kota Kinabalu will include those from branded business hotels such as Crowne Plaza, Holiday Inn Express, Citadines, Pullman and Hotel Jen by Shangri-La — which will contribute 1,579 rooms — and branded resort hotel Alila Dalit Bay, which will add 152 new rooms and 74 villas. As for the residential sector, Koh foresees a challenging condo market due to a substantial incoming supply of 1,200 units this year and another 2,400 units next year. Kota Kinabalu currently has about 10,000 condos. There were limited new supply of landed properties over the years and prices have sustained. In Kuching, all property sectors are expected to remain stable except for the high-rise residential segment, which will see a substantial increase in stock — up 20% to 24,653 from 20,546 last year, says WTW Sarawak managing director Robert Ting Kang Sung. The high-rise residential segment saw a 50% year-on-year decline in launches last year while stock is expected to double this year, putting pressure on sales, rents and occupancy. Meanwhile, the landed residential segment remained stable last year with a lack of new launches in prime areas. For the retail sector, asking prices and rents are seen stagnating at RM700 psf for upper floors and RM2,000 psf for prime units. The office sector is also expected to see a lacklustre performance this year. “We expect the property market to remain unchanged and investor sentiment to be cautious. The buyers’ and tenants’ market will continue to consolidate and moderate. We still expect some sales but on a moderate scale,” says Ting. He notes that Sarawak has ample land and low population but poor connectivity due to its vastness. “The Pan Borneo Highway, stretching from Kuching to Miri, will be the key catalyst. When the first phase is operational in 2021, we expect a lot more areas to open up.